Normally when I do a post it is about my family. Today’s post may or may not be about MY family (still checking on that) but it is definitely a post worth writing. Mamie Rearden of Edgefield, SC turns 114 years old today. This is important to me for several reasons. 2) She attends the same church as my grandparents when they lived in Edgefield and probably has family members that were founders of that church. 4) She is the same age as my grandmother would be if she was alive today. “I was watching the Today show and they were honoring people over the age of 100. The name Mamie Rearden popped up. 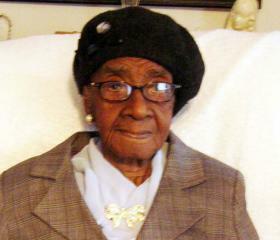 She turned 113 years old on September 7, 2011. She is from Edgefield, South Carolina and attends Springfield Baptist Church. When I saw and heard that I lost it. I stated how great it would be for me to get to talk with her. She was born the same year (1898) as our grandmother the late Annie Mae Senior Yeldell. I knew that if I could speak with her she could give me so much information on our family. So I went to the internet and started to read about her. I got names of her children and learned that she is of sound mind. So I thought some more and decided to contact the African American genealogist library to see if there is any way I could speak with her. It is because of the story listed above my connection to Mrs. Rearden has grown. I am still trying to get to Edgefield to maybe get that interview. But wishing her a Happy Birthday is the most I can do. Happy 114th Birthday Mamie Rearden, if anyone is interested in more information on these amazing people or other supercentenarians(people over 110 years) we track all verified living supercentenarians at http://www.livingsupercentenarians.com.